Aerobic bacteria, also known as the good bacteria in the aquarium ecosystem that helps oxidize ammonia into nitrite and then into nitrate (NO3) is the most common bacteria written about in freshwater aquarium articles and books. Often what is left out in publications about the freshwater aquarium hobby is the lesser known beneficial anaerobic bacteria. Anaerobic bacteria live in areas devoid of oxygen. Anaerobic bacteria use the oxygen attached to the nitrate to respire, which frees up nitrogen gas that then can escape into the atmosphere. The most common areas within the aquarium ecosystem you can find anaerobic bacteria is in the lower layer of sand and deep gravel beds. It can also be found in the gastrointestinal tract of animals, including fish. To encourage large populations of anaerobic bacteria the environment must not have easy access to the oxygen rich water column. The process of reducing nitrate in the aquarium with anaerobic bacteria is often referred to as denitrification or a method Natural Nitrate Reduction (NNR). Anaerobic bacteria first convert the nitrate to nitrite (NO2), and then to nitrogen gas (N2). The process of denitrification can also produce a minimal amount of hydrogen sulfide, but the amount that is produced is also processed by other bacteria in the aquarium, and never reaches a toxic level. Hydrogen sulfide can easily be detected by a rotten egg (sulfur) smell. If you are a freshwater aquarium hobbyist that has spent anytime on the internet in Facebook Groups, Google+ Communities, or any of the many online forums, you will run across users posting the long running myth that anaerobic bacteria will create a toxic level of hydrogen sulfide that will kill fish. This myth has been around longer than I’ve been in the hobby (I started in 1971) and keeps on reappearing on a regular basis. 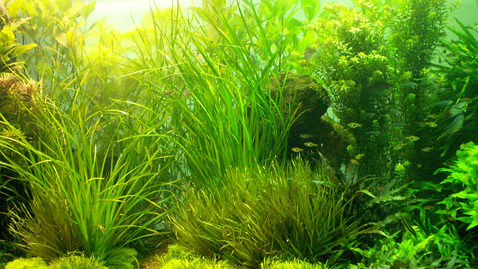 Often the bad advice that is given in these internet forums is to get rid of stagnant pockets by vacuuming the sand or gravel bed (see Aquaworld Aquarium article The Silent Killer, How to Use/Not Use a Gravel Vacuum in the Modern Aquarium  for more information). Marine reef aquarium hobbyist have known for decades about the benefit of having anaerobic bacteria in the system to help reduce nitrate. Marine aquarium authors Albert Thiel and Martin Moe Jr. both have sections in their books that have images and describe the operation of a filter called a denitrator (denitrifying filter) that is used to encourage a high population density of anaerobic bacteria. 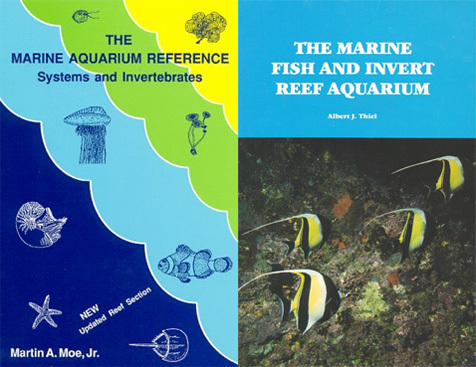 Albert Thiel’s book The Marine Fish and Invert Reef Aquarium (published 1988, ISBN - 0-945777-04-3) and Martin Moe’s book The Marine Aquarium Reference Systems and Invertebrates (published 1989, ISBN 0-939960-05-2) provide information on the operation of a denitrator filter. Books from Martin Moe and Albert Thiel that discuss the benefit of anaerobic bacteria in the marine aquarium and how to operate a denitrator filter. Marine reef aquarium hobbyist known the important role anaerobic bacteria play in controlling nitrate in the aquarium, but for some reason the freshwater side of the aquarium hobby has been slow in recognizing the benefit. Marine aquarium hobbyist have used a deep sand bed and lots of live rock in the aquarium ecosystem (including the sump) to provide as much as possible an environment for anaerobic bacteria to colonize. In a freshwater aquarium ecosystem we can encourage the colonization of anaerobic bacteria by using a sand bed of an 1.5 to 2 inches (4 to 5 cm). For a sand bed, I typically use a #60 grade sand I get from my local landscaping rock and sand retailer. I am able to purchase sand from them in 50 or 100 lb (22 to 45 kilogram) bags for around $10US. The larger the grain size the deeper the bed must be to encourage the development of an anaerobic layer. In order to benefit from anaerobic bacteria’s nitrate reduction capability, there must be a very slow exchange of water through the substrate. To help with a slow water exchange through the top layer of the sand bed, adding fish like sand sifting cichlids, Corydoras catfish, loaches/botias, and Malaysian livebearing snails are good choices. Besides only needing a thinner layer of sand to take advantage of anaerobic bacteria’s ability to reduce nitrate, it also helps keep uneaten food and detritus on top where it can filtered out of the aquarium water column. Anaerobic bacteria does require an alkaline/basic pH greater than 7.0 to thrive. Freshwater aquariums where the fish selected for the system are from Central America, coastal North and South America, and African rift lakes are excellent examples that can benefit from encouraging anaerobic bacteria colonies. To maintain an alkaline pH I recommend you read the Adjusting Water Chemistry section of Mastering Freshwater Aquarium Ecosystems (free eBook on this website). Once your substrate has established an anaerobic layer it must not be disturbed when conducting aquarium maintenance. Pulling detritus off of the top of the substrate is all that should be done when doing a water change. So the next time you think about the beneficial bacteria in the freshwater aquarium, don’t forget about the anaerobic natural nitrate reducers.